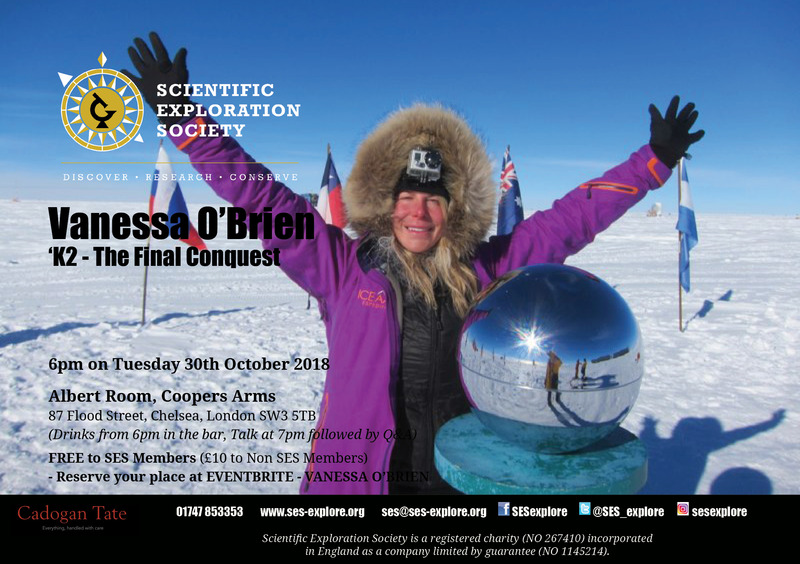 The SES is delighted to announce that Vanessa O'Brien will be the speaker at October's Explorer Talk and will give a talk about K2 - The Final Conquest on Tuesday 30th October 2018 at the Coopers Arms, Chelsea. On 28th July 2017, SES Member and dual national Vanessa O’Brien became the first American or British woman to successfully conquer K2 after a gruelling 16 hour summit push where she encountered deep snow, howling winds, increasing precipitation and extremely cold temperatures. This was Vanessa's third consecutive year attempting K2, and her team’s dedication and persistence paid off as they became the only team to summit in 2017, following two years of no summits on K2. On 30th October 2018, Vanessa will take us through what she discovered about climbing K2 and the people of Pakistan, the research that showed glacier contamination, and the historical conservation she led at the Gilkey-Puchoz Memorial. VENUE: Albert Room, Coopers Arms, 87 Flood Street, Chelsea, London SW3 5TB. DATE & TIME: Tuesday 30th October 2018 - Drinks in the bar from 6pm; Talk in the Albert Room at 7pm (followed by Q&A); More Drinks in the bar afterwards, if wanted! ADMISSION IS FREE TO SES MEMBERS: Entry is FREE to SES Members and £10 to NON-SES Members! We need to keep an eye on the number of people attending to avoid exceeding capacity, so please obtain your ticket from EVENTBRITE. Event generously supported by Cadogan Tate. We are grateful also to TexEnergy who have kindly donated a gift to the Speakers at the Explorer Talks.